Definition at line 55 of file CQExpressionWidget.h. Definition at line 80 of file CQExpressionWidget.cpp. References CCopasiRootContainer::getDatamodelList(), mExpression, CExpression::setIsBoolean(), and CCopasiObject::setObjectParent(). Definition at line 120 of file CQExpressionWidget.cpp. Definition at line 125 of file CQExpressionWidget.cpp. This function ensures that any characters on Expression Widget are validated to go to further processes. Reimplemented from CQValidator< QTextEdit >. Definition at line 95 of file CQExpressionWidget.cpp. 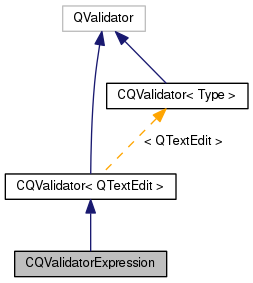 References CQExpressionWidget::getExpression(), mExpression, CQValidator< QTextEdit >::mpContainer, CQValidator< QTextEdit >::mRetrieve, CQValidator< QTextEdit >::setColor(), and CQValidator< Type >::validate(). 97 // The input is the display version of the infix string. 98 // We must first convert the display string to infix. Definition at line 76 of file CQExpressionWidget.h. Referenced by CQValidatorExpression(), getExpression(), setBooleanRequired(), and validate().